Elerrina is the latest addition to our household. She’s the second girl from our good friends Minna and Kjeld Krogh (Felis Audax) in Denmark and arrived in June this year, 2003. As is so often thie case with NFCs she has fitted in here extremely well – we are absolutely delighted with her. Like her father, the superb show-winner Reddie Eddie, she has a very sweet and affectionate disposition and we can’t wait to see what kittens she produces in the near future (we plan to mate her in early 2004). In her show career so far she has attained champion status in three straight shows along with one BIV and nomination. Phoebe is another superb example from Mel and Neil Gardner (Kjaerligkatt) – our sincerest thanks to them. 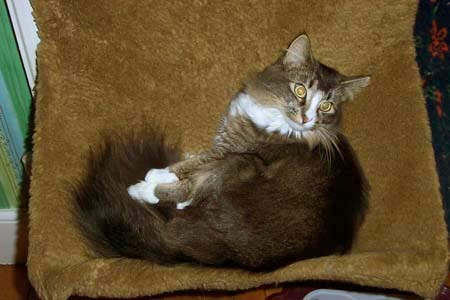 Her first litter of kittens arrived in June 2002 and her second should appear in late 2003. In her shows she has gone on to become an International Champion at the World Show in Helsinki 2003 and has been to shows in Arnhem (NFO Special, Netherlands) and St. Quentin (France). Monsoon is from Astra’s third litter and recently returned to live with us again. 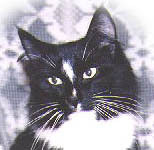 She has done well at a number of shows, achieving best Semi-Long Haired Kitten in Show at Derby in April 2002. She is due to give birth to her first litter in August 2003. In common with her mum Astra, she has a penchant for sitting on your lap and nipping your nose and chin! ASTRA came to us in October 1998 from Denmark. She had her first litter of kittens in December 1999, her second in February 2001 and her third in November 2001. She is very devoted to her kittens but is also tolerant of them being handled. Despite her small size she has produced some impressively large cats. Astra’s fourth litter arrived on Friday 25th July 2003. She gave birth to two black & white boys (click to view). She has been a success in her shows so far, winning her first certificate on her third outing at the Edinburgh & East of Scotland Cat Club show on 19 June 1999, she also won Best of Breed and two other firsts and also won a second Challenge Certificate. Astra came from the Felis Audax Cattery of Minna and Kjeld Krogh – we thank them for our wonderful girl and all the help and support they have given. 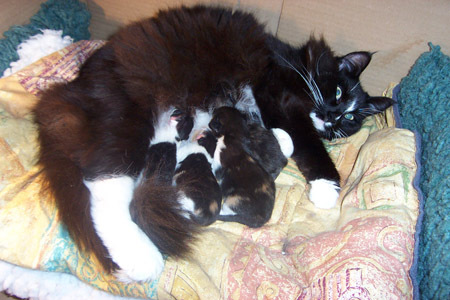 Vardi gave birth to her first litter of kittens in December 2002. This litter has been a great success, with four beautiful healthy kittens whose size and type we were delighted with. She’s from our second litter of Norwegians, her coat is an excellent example of a ticked tabby. She has had a lot of success on the show bench and at her first adult show she obtained her first certificate and was also nominted for best in show. We hope that she will have her first litter of kittens in summer/autumn. Vardi could be a bit bigger with a stronger chin, but she is well balanced and proportioned and has so far impressed most Judges at shows.